Bill and I both spoke about the sin and war crimes the U.S. committed in Hiroshima and Nagasaki, and of the biblical imperative to repent and disarm. Bill also spoke to the legal mandate we have under international law to carry out nonviolent acts of resistance to prevent war crimes. I spoke about my encounter with the Hibakusha (A-bomb survivors) 32 years ago during the first UN Special Session on Disarmament and how it was a life-changing experience for me. My meeting the Hibakusha was one on the main reasons why I have dedicated my life to working for disarmament and ending war. I also quoted Pope Paul VI that the nuclear bombing of Hiroshima and Nagasaki was a “butchery of untold magnitude.” I quoted, too, Pope John Paul II who, upon visiting Hiroshima, declared: “To remember Hiroshima is to abhor nuclear war. To remember Hiroshima is to commit oneself to peace.” I then held a photo of the destroyed city of Hiroshima and asked the Judge to imagine all of Alexandria being incinerated. This prompted her to speak about the 9/11 tragedy. We then told her that we oppose all violence and are working to making sure there are no future Hiroshima’s or 9/11’s. Through God’s grace we were able to spark a dialogue with Magistrate Buchanan, who on previous ocaasions, has sentenced Bill and others peacemakers to jail. However this time, she found us guilty but gave us a $30 fine. The case for two other peacemakers, Joy First and Max Obuscewski, who were arrested on August 9, was continued to January. Let us continue to pray for each other as we strive to make God’s dream of peace and justice for our world a reality. in repentance for the murderous crime of incinerating an entire city. a sin that continues to threaten the survival of the human family. the burning children, the charred bodies, the shadows on the rock. 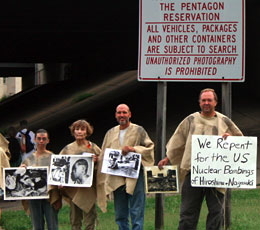 I pray for the survivors who, risen from the dead, cry out for nuclear abolition. that all nuclear weapons can be abolished–Now! so that we can become channels of your peace, mercy and nonviolent love.